This Father’s Day, Easter Seals recognizes a veteran father who’s worked hard to help launch and sustain several veterans programs – and the veteran son who’s followed in his footsteps. If you thought father and son partnerships in the workplace were a thing of the past, look no further than Easter Seals Serving DC | MD | VA. When Daniel Seidel was growing up in Tallahassee, Fla., he was constantly exposed to veterans of the Vietnam War and other American conflicts. Meanwhile, his father, Stan Seidel, a Vietnam veteran himself, was helping veterans find their way back to the workforce. What neither of them could envision at the time was that they would be working together, 25 years later, helping Easter Seals assist veterans overcome employment barriers. This Father’s Day, Easter Seals celebrates Stan, the father who’s worked hard to help launch and sustain several veterans programs – including the new Veteran Staffing Network (VSN), and Daniel, the son who has followed in those footsteps as he works full-time to secure meaningful employment for veterans at Easter Seals. VSN is an innovative social enterprise launched by Easter Seals Serving DC | MD | VA that addresses the needs of the veterans, wounded warriors, members of the National Guard and Reserves and their families seeking to transition to meaningful civilian employment, and the employers who want to hire and retain highly trained leaders. For more information, visit Easter Seals online. Stan Seidel served in the 4th Infantry Division as a solider in the U.S. Army during the Vietnam conflict in 1968. He was honorably discharged from the Army two years later and received his bachelor’s degree from Rutgers University. In 1978, he was approached with an opportunity to earn a living by speaking to employers about the advantages of hiring veterans in West Palm Beach, Fla. For a country that still had harsh feelings about the Vietnam War, this was a daunting task. Stan took that challenge and translated it into a successful career that spanned more than 30 years. He did so by presenting himself as both open and truthful to veterans and employers and holding himself accountable. Stan found great importance in letting the veterans know that he has walked a mile in their shoes and their military service should not be a detriment to finding civilian employment. His efforts led to great success for both veterans and employers. That success translated into a 27-year career in veterans employment and training in the U.S. Government, all with the Veterans’ Employment and Training Service (VETS) of the U.S. Department of Labor. His first stop was Tallahassee, where son Daniel Seidel was born. It was in Daniel’s first years of life and later as he moved to suburban Washington, D.C., that he gained an appreciation for the men and women who serve this country. By the time Daniel became a teenager, he realized that instead of heading straight to college, the right move for him was to enlist in the U.S. Navy. He trained at the Field Medical Service School at Camp Pendleton. That training led to separate missions to Iraq and Afghanistan, where he provided medical attention to Marines who were searching for Improvised Explosive Devices (IEDs). Daniel spent six years as a Corpsman. While Daniel was finishing his service, Stan, still with the Department of Labor, began working with Easter Seals, which was expanding its services that assist people with disabilities to services that enhance the lives of military, veterans, wounded warriors and their families. Stan was the driving force that ensured Easter Seals Serving DC | MD | VA received a grant from the federal government that launched the Veterans Workforce Investment Program (VWIP). 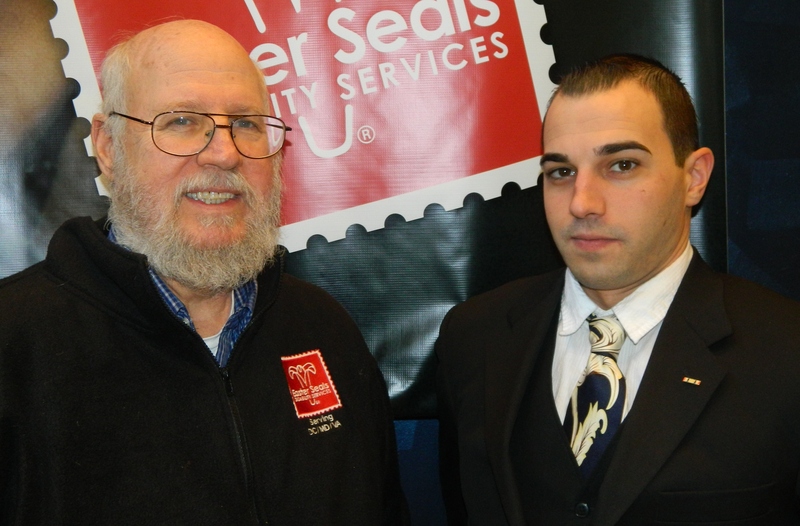 When Stan retired from the Department of Labor in December 2011, he knew that becoming a volunteer at Easter Seals was the right move to make. Since then, Stan has helped Easter Seals military and veterans programs grow exponentially. He was instrumental in the development of the Veteran Staffing Network (VSN), which is a self-sustaining social enterprise model that serves the entire military community. VSN is expected to redefine veterans employment and temp-to-perm placement services by taking an ecosystem approach that attacks the barriers to employment at each pain point within the system, supporting veterans, their families and the organizations that employ them. As Stan was building the military presence at Easter Seals, a case manager position within the veterans programs opened up that just happened to fit Daniel perfectly. In the summer of 2012, Daniel accepted the position, in which he is responsible for placing veterans in employment and employment training, while informing them of educational benefits and opportunities. When asked if they find a poetic symmetry to their careers, the father-and-son duo isn’t really hung up on that fact. They are just happy that they can both be in positions where they can continue to assist those who protect their country.